That is what researchers have found in South Dakota where the prairie rattlesnake is the only venomous snake to be found. Over the past couple of years, Terry Phillipp (of Reptile Gardens in Rapid City( has noticed many rattlesnakes with what he calls “curly-Q” tails. Imagine the tail on a pig, and you’ll get the idea. Phillipp says the tail muscles on these snakes have atrophied, and accordingly, can’t move the rattle. 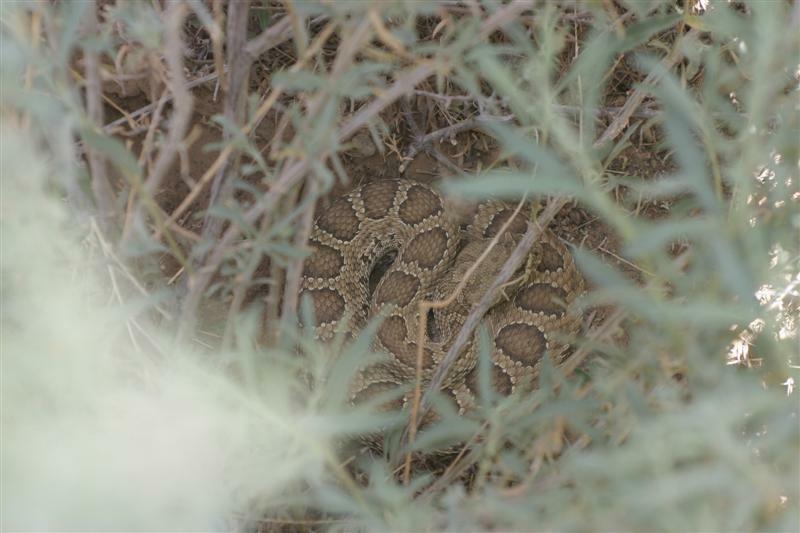 Rattlesnakes can camouflage themselves well, and, if they’re not heard, they’re likely not killed. A prairie rattlesnake hidden in the grass. National Park Service photo. Phillip’s theory is that if the rattlesnakes that announce themselves are spotted and killed, those with the defective tails are breeding and creating more snakes that can’t rattle. It is an interesting phenomena and is the type of adaptation that makes sense. With an increasing human presence in most wild areas, encounters with rattlesnakes are increasing and most of the time that equals a dead rattler.